At Body Perfect, we offer our customers outstanding car body repair in Wrexham carried out to the latest PAS:125 standards. By working to the latest trade and industry guidelines, we are able to produce perfect repair work with the guarantee of perfect colour matching, superior workmanship and unrivalled customer care. We use modern working materials to complete car paintwork in Wrexham with low VOC emissions that help to preserve the integrity of our local environment and ecosystem. Our accident repair work makes the most of the latest water-based paint systems for your convenience and peace of mind. At Body Perfect, our automotive services are carefully tailored to accommodate all aspects of vehicle care. We are proud to offer our customers affordable car servicing in Wrexham at independent rates that are consistently lower than those available at nearby main dealer outlets. Body Perfect is also your leading local choice for new exhausts in Wrexham. We can supply and install full or partial exhaust systems by appointment or on a while-you-wait basis. 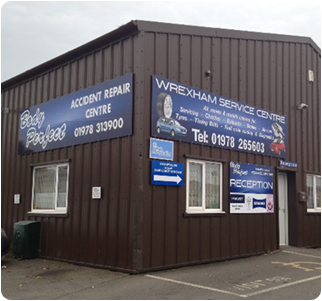 Call Body Perfect today for accident repairs, car servicing and new exhausts in Wrexham.